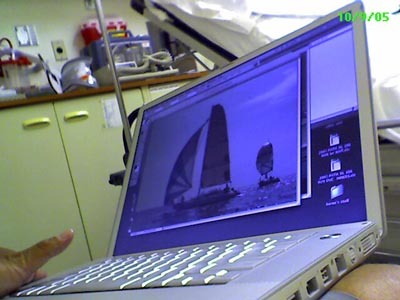 Working on editing my sailing photos while waiting behind curtain #2 in the ER. Seems x-ray dept is backed-up a bit. *UPDATE* Okay, the doc got the x-rays back, I’ve got a hairline fracture on my toe, got it buddy-taped to the 2nd toe (or is it toe #4?) and got sent off with some pain meds to be taken at night. When I walk it feels like someone is hitting my toe with a ballpeen hammer, kind of like my own built-in Whack A Mole game with my toe being the mole. Next PostNext You are an Ironman!